Halloween. The time when the undead come to town. And when boarded up haunted houses start making eerie sounds and come alive. This year, however, not all of them seem that decrepit and spirited. Some in fact remain relatively quiet. These are the haunted houses of Schengen. Haunted, yet alluring. Indeed, they can be quite luxurious. They also do not appear in creepy places (So no Castles in Transylvania – not yet. at least, for Romania is still waiting to join Schengen…). On the contrary, they rise along swanky neighborhoods or exclusive beach resorts. Who lives there? Hmmm, good question. If we had an answer, these houses would not be haunted… A more pertinent question is: why would anybody in their sane mind be so foolish as to own such as a ghostly abode? Wait a minute: it’s Schengen, stupid! Yes, what makes these architectural ghosts so attractive is that they happen to be in the most sought-after place on earth, namely Europe (Yes, some find the decadent Old Continent still attractive!). And if you are not a European citizen and require a visa to enter Eurodreamland, then why not buy your way into paradise by claiming a fictitious residence there? 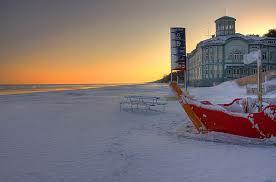 And here enters Jurmala, the Latvian resort city by the Baltic Sea. In 2010, the Latvian government introduced a program that allows foreign citizens to acquire residency in the country if they are willing to invest at least 71,000 euros. Minimum requirement to maintain residency: have a local address (an apartment in Jurmala sounds good!) and be there one day per year (yeah, the day the haunted houses of Schengen come alive!). And who cares about the sandy beaches (The Baltic sea is not the Caribbean after all). With a local residency in your pocket, the doors of Europe are open to you! No more hassle at EU embassies! No more dealing with these callous and ungrateful European officials! To good to be true. Indeed, in three years, around 7,000 ‘zombies’, mostly well-healed Russians, Chinese and Kazakhs, have taken advantage of this unique opportunity. But like everything else, good things are bound to come to an end. Latvia is now feeling a bit of pressure from its EU partners (should we blame them?) to close this loophole. And they might have another reason to do so. Purportedly, the rationale for this program is to encourage money flows into the country. Yet this money is often laundered and sent back to the ghost’s (ehmm, resident’s) country of origin. So much for Latvia’s gains! None should that surprised then if this year’s Halloween might seal the program’s fate: R.I.P the Haunted Houses of Schengen! I got this site from my buddy who informed me regarding this website and at the moment this time I am browsing this website and reading very informative articles or reviews here.